No, no offer is binding on the seller. No offer is binding upon the buyer until such time as the seller accepts the offer and delivers it to the buyer. When an offer is received, here are the choices a seller can make. Reader Question: If I make an offer, is it binding on the seller until I have a chance to make a higher offer? Can someone else make a higher offer before mine is accepted or rejected? Joe D.
1. Accept the offer and deliver it back. The offer is now a contract. a. Take no action whatsoever. Be silent or do nothing. b. React with a simple “no”. c. Make a counter proposal back. This is a rejection of your offer. d. Make a multiple-counter offer back to multiple offers, but not necessarily every offer. 1. Let the offer stand until the seller reacts to it or it expires. 3. Change the offer. Reduce it, increase it or change it in some way. Any other buyer, or buyers, can make an offer before your offer is presented, after your offer is presented and before the seller reacts to it, or after the seller has accepted your offer but before it is delivered. The act of making an offer does not give a buyer any right or priority in negotiations. The listing agent controls this process as the single point of contact. Their job is to see the rules are followed, and all parties kept informed as events transpire. Most offers have acceptance time deadlines after which the offer or counter offer expires. The rules on what constitutes “delivery” vary somewhat from state to state. 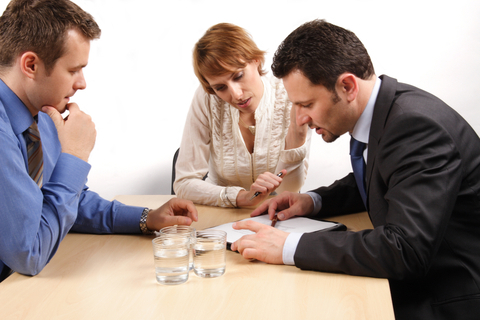 When there is only one buyer this process can be managed fairly easily. When multiple buyers appear on the scene this process can be exceedingly difficult to manage because there are so many moving parts, offers modified with buyers jockeying for position and changing their minds during the fray. The seller is working to find the best buyer. Add to that the personalities and experience levels of all individuals and it can be a harrowing experience. It is very rare, but the worst conceivable outcome is when the seller contracts to sell their home to more than one buyer. Here, is an article entitled “The Rules Of The Game“. It explains what the rules are and who makes the rules. An agent may not think to explain a potential problem because there are hundreds of events that could happen in a real estate transaction, but rarely do. If one understands the playing field, one can utilize strategies that work in their favor before encountering a problem. As an example, knowing that another buyer can make an offer before the seller has reacted to an earlier offer could cause a buyer to ask for an answer quickly. Is that a good strategy? The answer may depend on a variety of circumstances. Some sellers may react negatively to being “pushed” to make a decision while another may like the idea of “getting this over with”. Knowing something about the seller’s circumstances and mindset may help determine the best strategy. Joe, there are other articles about negotiating, determining value and other pertinent factors to help a buyer prepare to make a thoughtful offer on the Dear Monty website. If this information was helpful, consider linking to the site as new articles appears every week. In Monty’s Answers read about situations which “never happen” to help insure they do not happen to you. Joe, Good Luck in your search. Please ask with your other questions. If you need help finding an agent or locating an article, I am interested in helping consumers reach the goal line; tackle free, along the way.